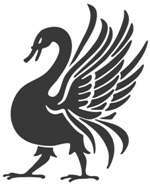 ⬅ Raging Swan Appearing in Mythoard! A bustling, busy place Wellswood stands near the juncture of two trade routes. Here, travellers and traders shake the mud of the road from their feet and Lord Issakainen grows fat on the taxes and tolls he levies on both traveller and villager alike. And although Wellswood is famed for the warm welcome travellers find in its taprooms and businesses the village is well known for another reason entirely. For Wellswood is aptly named, indeed. 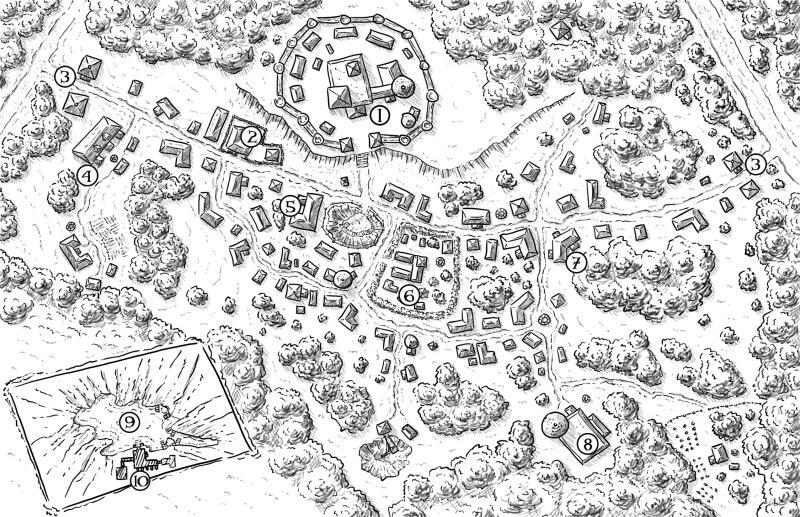 Many wells—both natural and dwarf-made—dot the village and far below lies Lake Thraren. This large subterranean lake is navigable in parts and the villagers fish its lightless waters for the many exotic fish swimming therein. A small clan of dwarves—the Erdikr—dwells upon the lake’s ebon shores. Nominal servants of Lord Issakainen they permit few outsiders to visit their home. Wellswood is not the peaceful place it first appears. Lord Issakainen grows greedy and taxes have been rising steadily of late. Merchants grumble at the increased costs; some simply take the Old Road and bypass Wellswood altogether. And recently some villagers have begun to wonder exactly what clan Erdikr is up to in their lightless hold. Castle Issakainen: Castle Issakainen’s lofty battlements overlook the trading routes that meet just north of the village. The Footsore Wanderer: Occupying a walled compound, the Footsore Wanderer has ample accommodations for all but the largest caravans. Toll Booth: From these watchtowers Lord Issakainen levies tolls on all travellers entering Wellswood. Wheels & Wagons: Run by two brothers, this large business can repair almost any mode of transport. Tuomi’s Outfitters: This meticulously organised shop has everything a traveller should need to reach his destination. The Boot & Wheel: This small inn does a roaring trade; its guests are welcome to pitch their tents within the inn’s grounds or to hire one of its many small lodges. The Angry Badger: A local’s watering hole, the Angry Badger serves cheap, plentiful drinks and basic, but filling, food. Additional entertainments are always available upstairs (and occasionally downstairs). Travellers’ Rest: This rambling shrine dedicated to the god of travellers is open to all. Travellers low on funds can sleep in the shrine for free. Lake Thraren: Lord Issakainen tightly controls access to Lake Thraren and tithes those fishing its waters. Don Galir: Home of the Erdikr clan, this small dwarven hold lies under Wellswood; non-dwarves are rarely admitted. Wellswood lies in the Duchy of Ashlar and is part of the Gloamhold campaign setting. Wellswood is part of the Village Backdrop line from Raging Swan Press. You can learn more about the village here. I absolutely LOVE these tidbits!